1Why tarot, and why now? 2Morning routine or list of chores—you decide. 3.1Tarot allows for surrender to something bigger than yourself. 3.2The element of surprise is whimsical and fun. 3.3Tarot illuminates or helps you see situations in a different light. Tarot cards can help you see the same old situation in a new light, giving yourself a space for insight to occur. Let me preface this by saying that tarot is something I’ve only dabbled in—I’m certainly not an expert nor am I claiming to be! Tarot has been presented to me by healers in one-on-one sessions, my own research, and, of course, Instagram. I’d written about tarot in my book, the Spirit Almanac, but didn’t practice it regularly on my own. I’d be remiss not to mention that this is about finding my own groove with tarot, a method that fits with my lifestyle, and that’s what I’m sharing here, not an official method of any kind. That being said, tarot is something I’ve been intimidated by for quite some time! It always seemed like there were lots of rules and myths around the practice. I once heard that you’re not to purchase your own deck; it’s supposed to be given to you. Many modern practitioners will scoff at this and buy one anyway, and with so many beautiful tarot decks out there, it’d be a shame not to, but I waited until my colleague Emma gave me a deck, the beautiful Fountain Tarot one. Why tarot, and why now? I started practicing tarot on my own this summer while I was in the middle of a personal health crisis, too depleted to engage in the things that normally brought me joy. SoulCycle, yoga classes, running, lifting weights, even Pilates was too much on my symptomatic body. Symptoms ran the gamut: GI and digestion issues, dizzy spells, headaches, joint aches, anxiety, and simply feeling “off” and not myself for an extended period of time. Morning routine or list of chores—you decide. Pick up any self-help book and they will tell you to make the morning your time. Oil pulling, dry brushing, meditating, moving, yoga, morning pages, morning art practice—the list of things I thought would make me feel better was actually just slowly eating up my day. On days when I had “nothing” to do, I noticed I felt much better even if I chose to do all of the aforementioned things. When you’re stressed about something out of your control—for me, it was my health—it may feel better to call on an outside resource for guidance. Looking inward is a worthy pursuit, make no mistake, but sometimes it can exacerbate a stress response. And when your physical and/or mental health are at risk, it’s not worth the extra stress. Not at that moment, anyway. I personally always feel the most in touch with otherworldly forces when I’m extremely stressed, anxious, or when matters are serious and out of my hands. When facing the unknown, people pray, call on each other, support one another, and tend to stretch their belief systems to a place where magic and miracles are possible. It’s no wonder I turned to tarot during this challenging, demanding, emotionally exhausting time. Pulling a tarot card daily gave me a channel for my rituals and for my anxiety. I decided to pick one of the above activities and allowed the tarot pull to inform that day’s practice. For 35 days (and counting) I’ve developed a daily tarot pull ritual. I shuffle the cards and divine a card. I haven’t memorized all the cards and their meanings yet, so I cheat and consult the guidebook. I’ll read it aloud either to my husband or myself. If Aaron is with me, he’ll do a pull too. I then jot down which card I got and the date, because sometimes the significance becomes clearer in retrospect. Or I’ll think about what our pulls mean for us individually and in context of each other. Some days, I’ll ask a specific question before I pull. Tarot allows for surrender to something bigger than yourself. Part of the appeal of tarot is that it (or the Universe, Spirit, whatever you believe) does some of the “thinking” for you. While most of our sense of control is simply an illusion, tarot allows you to completely give it up, letting nature take her course. It’s a great exercise for recovering perfectionists. The element of surprise is whimsical and fun. Pulling a card each day is a way to offer yourself some newness without actually having to buy anything (after you’ve got your deck, of course—no judgments if you purchased one yourself!). It’s a little like a fortune cookie; you never know what you’re going to get and that element of externalized surprise in and of itself makes a ritual unique. Tarot illuminates or helps you see situations in a different light. 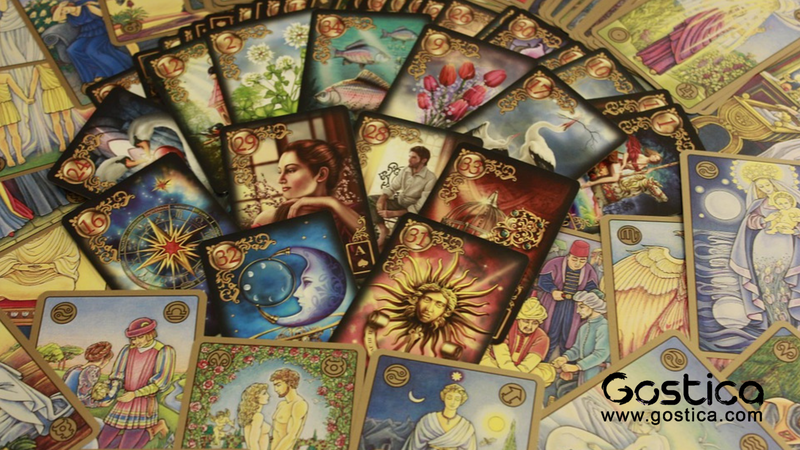 Just when you think or feel that you’ve analyzed your current problem, scenario, or predicament from every angle, tarot brings a new perspective. Similar to having a friend or therapist with an outside perspective, pulling certain tarot cards can help you see the same old situation in a new light, giving yourself a space for insight to occur. This was written by Lindsay Kellner for MindBodyGreen.